If you find a lack of spaghetti noodles at the Piggly Wiggly in a few weeks, blame it on Lady and the Tramp coming to Blu-ray on Feb. 27. The new upgrade of the romantic tale of a doggy love has tons of bonus features on the disc and accessed digitally. If you forget about picking up a Valentine’s Day gift for that special someone in your life, tell them you pre-ordered them a copy and then quickly pre-order Lady and the Tramp. Here’s the press release from Walt Disney. BURBANK, Calif. — This February, Disney’s cherished animated classic, Lady and the Tramp, joins the highly celebrated Walt Disney Signature Collection. Every member of the family will treasure this timeless tale—loaded with three versions of the film, classic bonus material and three all-new features—when it heads home on Digital and on Movie Anywhere Feb. 20 and on Blu-ray on Feb. 27. The Walt Disney Signature Collection edition offers three exciting ways to watch Lady and the Tramp —the original theatrical version, sing-along mode and Walt’s story meetings—both Digitally and via the Multi-screen Edition (formerly the Blu-ray Combo Pack). The Multi-screen Edition includes Blu-ray, DVD and a Digital copy, giving in-home consumers the flexibility to watch the film on different devices. In addition to classic bonus features, all-new extras invite viewers to enter Walt Disney’s original office suite on the Studio lot, discover Walt’s personal passion for pups, and receive a celebrity-hosted spaghetti and meatballs cooking lesson. 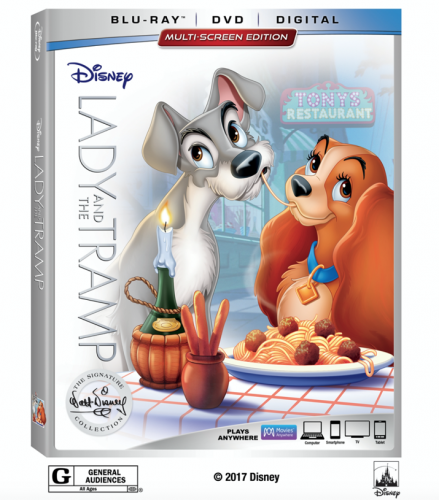 “Lady and the Tramp” is the sixth title to join the Walt Disney Signature Collection, which includes groundbreaking films created or inspired by the imagination and legacy of Walt Disney, featuring timeless stories and characters that have touched generations. The film takes its place alongside Snow White and the Seven Dwarfs, Beauty and the Beast, Pinocchio, Bambi and The Lion King.